In this St. Louis living room, the sofa’s silk pillows—a bargain find at T.J. Maxx—determined the soothing palette. 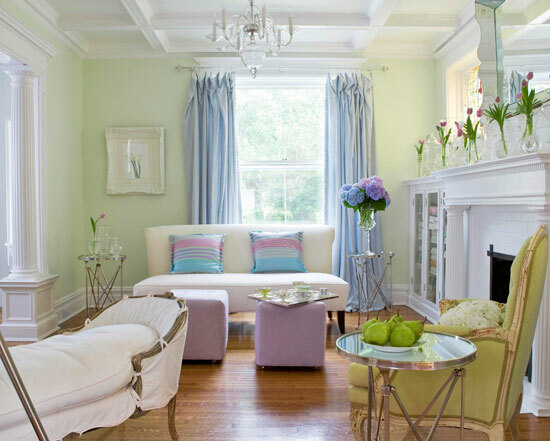 The walls are painted a soft mint green, while pops of pastels appear in the window panels, twin ottomans, and Queen Anne chair. The classic burgundy of a pool table’s felt is the inspiration for this billiard room. Fiery reds appear in the grasscloth wall covering, Kilim-covered George Smith club chairs, and the geometric folding screen. The round mirror above the mantel takes its “cue” from the billiard balls. A colorful and luxurious Scalamandré weave on custom club chairs inspires the theme of this Key West home. Matching pillows sit on the sofa; custom fringe on the Robert Allen drapery echoes the floral fabric’s soaring notes. The homeowner’s collection of blue-and-white china influenced the Lee Jofa fabric chosen for Hickory Chair armchairs and a Stark rug in the sitting area of this Indiana home. “The design of the house really evolved around a classic American look,” says designer Suzanne Kasler. Designer Brian Connolly saw the dazzling potential in this historical New York City apartment’s original parquet flooring. To set off the beautiful wood, he chose a terra-cotta hue to cover the Venetian plaster walls. See more from this apartment on the next slide. Connolly also pulled the strongest hues from the homeowner’s art collection to punctuate the living space in bright corals and tangerines. Needlepoint chairs plucked from a Paris flea market inspired the soothing color palette throughout this entire Houston home. The mellow golds and browns from the Parisian chairs continue into the dining room. Window panels are a cooler shade of cream to balance out the rich Fabricut fabric on the chairs. Calming blues and greens are a natural for a home on the shore. This showhouse porch evokes Maine-inspired nostalgia with its sea-glass hues and playful turquoise paisley. For a less obvious seaside palette, designer Patrick Lönn used a “dry beach” concept. “I was propelled by the water, sand, and driftwood on the beaches of Long Island, the majestic sailboats with their canvas sails, and Montauk Point’s grand lighthouse with its bold horizontal-striped tower,” says Lönn. A collection of contemporary art drives the palette of this Newport Beach home. Golden taupe armchairs repeat colors in a painting of California’s Crystal Cove beach hanging above the limestone fireplace. Homeowner and reality TV star Jill Zarin updated her New York City home with a personal touch. Friend and designer Brad Boles decided on a palette that complements Jill’s physical features—eyes, hair, and complexion. What resulted was a spacious apartment awash in blue-greens and teals, balanced by shimmery neutrals. The quirky original wallpaper in this New Jersey colonial entryway was the unusual inspiration for the home’s hues. Described by the homeowner as “mostly neutral with hints of soft blue and pinky-reds,” the tones extend throughout the house. See more from this home on the following slide. The soft pink and dusty blues of the entry’s wallpaper also appear in the master bedroom. Linen drapery from Carleton V set the tone for the rest of this bedroom. Blue-greens, cream, and hints of muted chartreuse also make an appearance in the plush bedding and upholstered headboard. A barely blue French fabric with a circle motif at the windows sets the color scheme in this dining room, where dining-chair upholstery and a grass-cloth wall covering are a smoky blue-gray. A wool-and-silk rug has taupe branches winding on an ivory background. An eye-catching elephant mosaic in the living room lends its vibrant hues in unexpected accents throughout the rest of the home. Turquoise pops boldly against warm golden hues in the dining room. Vintage botanical prints in the dining room were the springboard for this home’s color scheme. Smart and sophisticated, chartreuse details are found in the Cowtan & Tout fabric of the dining chairs. Complementing the green hues are gold accents on the china and on the chandelier. Want more color inspiration? See our presentation on Colorful Living Rooms.